1. Preheat the oven to 180°C, gas mark 4. Heat a frying pan until hot, add the fennel and dry-fry for 2-3 minutes, until charred. Transfer to a board and, when cool enough, cut into wedges. Put in a large roasting tin in a single layer; season. Whisk together the lemon juice, oil and 50ml water; season, then toss with the fennel and thyme. Cover tightly with foil and roast for 30 minutes. Meanwhile, wipe out the pan and toast the walnuts for 1-2 minutes. Tip onto a board, cool slightly, then roughly chop and set aside. Add the chicory to the pan, cut-side down. Cook for 2-3 minutes, until charred. 2. Remove the foil from the roasting tin, stir the fennel, then nestle in the chicory, cut-side down. Add the wine and baste the chicory. Cover with foil again and return to the oven for 30 minutes, uncovering for the final 15 minutes, until the fennel and chicory are tender. 3. Meanwhile, put the spelt in a saucepan and cover generously with cold water. Add a pinch of salt, bring to the boil, cover and simmer for 15 minutes, until tender. Drain and set aside. 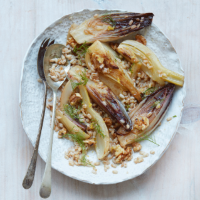 Remove the thyme sprigs from the roasting tin, toss the fennel and chicory through the spelt, then spread over a serving plate, drizzling over the juices. Scatter over the walnuts, lemon zest and fennel fronds before serving. This recipe was first published in Thu May 31 12:25:57 BST 2018.